Smart Management the Transformative IT leaders are under increasing pressure to keep their business knowledge and leadership skills sharp. | By Karyl Scott B usiness transformation means fundamental changes to a company���s organization, strategy and vision. It can be driven by external factors such as regulation, competition and consumer demands; or by an internal desire to discover new markets and create groundbreaking innovations. 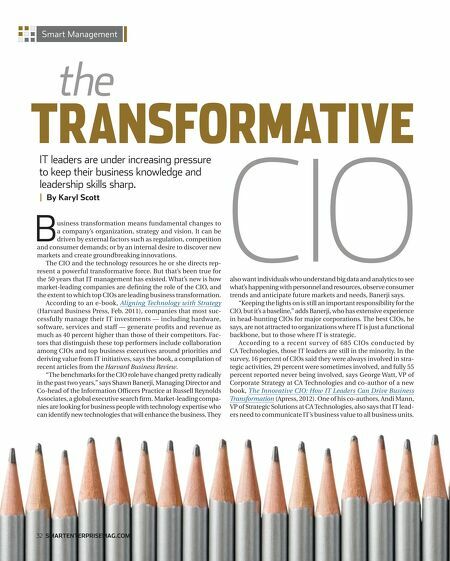 The CIO and the technology resources he or she directs represent a powerful transformative force. But that���s been true for the 50 years that IT management has existed. What���s new is how market-leading companies are defining the role of the CIO, and the extent to which top CIOs are leading business transformation. According to an e-book, Aligning Technology with Strategy (Harvard Business Press, Feb. 2011), companies that most successfully manage their IT investments ��� including hardware, software, services and staff ��� generate profits and revenue as much as 40 percent higher than those of their competitors. Factors that distinguish these top performers include collaboration among CIOs and top business executives around priorities and deriving value from IT initiatives, says the book, a compilation of recent articles from the Harvard Business Review. ���The benchmarks for the CIO role have changed pretty radically in the past two years,��� says Shawn Banerji, Managing Director and Co-head of the Information Officers Practice at Russell Reynolds Associates, a global executive search firm. Market-leading companies are looking for business people with technology expertise who can identify new technologies that will enhance the business. 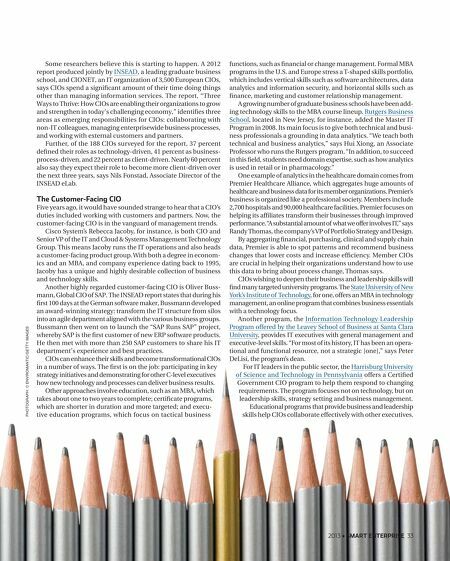 They 32 smartenterprisemag.com CIO also want individuals who understand big data and analytics to see what���s happening with personnel and resources, observe consumer trends and anticipate future markets and needs, Banerji says. ���Keeping the lights on is still an important responsibility for the CIO, but it���s a baseline,��� adds Banerji, who has extensive experience in head-hunting CIOs for major corporations. The best CIOs, he says, are not attracted to organizations where IT is just a functional backbone, but to those where IT is strategic. According to a recent survey of 685 CIOs conducted by CA Technologies, those IT leaders are still in the minority. In the survey, 16 percent of CIOs said they were always involved in strategic activities, 29 percent were sometimes involved, and fully 55 percent reported never being involved, says George Watt, VP of Corporate Strategy at CA Technologies and co-author of a new book, The Innovative CIO: How IT Leaders Can Drive Business Transformation (Apress, 2012). One of his co-authors, Andi Mann, VP of Strategic Solutions at CA Technologies, also says that IT leaders need to communicate IT���s business value to all business units.